Zoe the baby is having a bit of a cranky day. And when she's cranky, she can't help but TELL people about it! 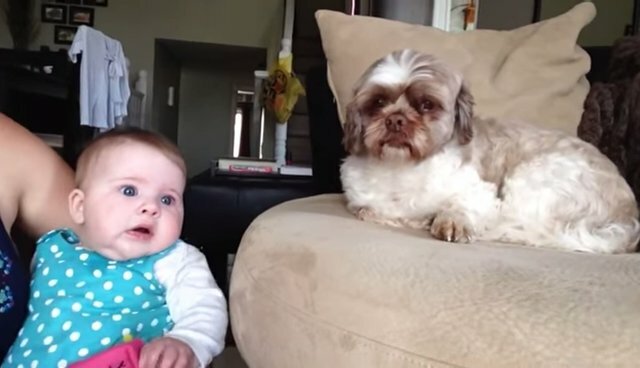 Her pup, however, isn't sure what all the fuss is over. And of course he doesn't want such a cute baby to be upset. He does his best to tell Zoe that there's really nothing to cry about! The two end up having a lively exchange on the subject. As always, it is important to listen to your dog. If they are whining incessantly, try to gauge what it is they want. Some dogs whine to request attention, or as a greeting, but if your dog is whining out of anxiety, it is important to calm them and try to remove them from an anxiety-inducing situation.